This morning when my alarm went off at 4:40am, I simply turned it off. I didn’t hit snooze, I turned it off. I fell back into bed, knowing full well that sleep would soon take over again. Then suddenly, the word “Steadfast” came to mind… clear as day. Believe what you will, but I believe God speaks to us in many ways, and sometimes it’s a single word to urge you in the right direction. Although I wanted the return-path to slumber to be my morning direction, it wasn’t. So, I got up. On Sunday, my pastor suggested we read Luke 18. After getting up, brushing my teeth, and packing lunches, I prayed, and opened up to Luke. 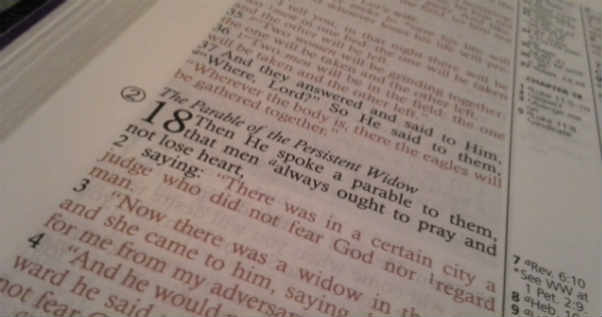 18:1 “Then He spoke a parable to them, that men always ought to pray and not lose heart…” My Bible’s side note: Prayer encourages steadfastness and guards against disheartedness… HA! One definition good ‘ole Mr Webster offers is, “firm in belief, determination, or adherence: LOYAL” He also lists the synonyms as, “resolute, true, faithful, staunch”. I want to be all of those things! I want to be those things in my faith, in my parenting, as a writer, as person in general! Sometimes it is far from easy to roll out of bed in the morning. Sometimes I dread my ‘to-do’ list. I get disheartened. But this morning God reminded me to be steadfast. To pray when I am having difficulty, or am frustrated. In Luke 18, Jesus also said, “The things which are impossible with men are possible with God”… takes a little pressure off. I don’t have to accomplish all things on my own, I have the God of the universe that cares enough for me to help out, whether it is in the small curve-balls life throws at me, or the heart-breaking struggles that no one knows about. ← Cake… An Issue of Civil Rights? Thank you Stephanie! I needed to hear this. I too shall remember the word “steadfast” for today. God Bless you daughter.